What Does it Take to be Business of the Year? | Zero Zone, Inc. What Does it Take to be Business of the Year? 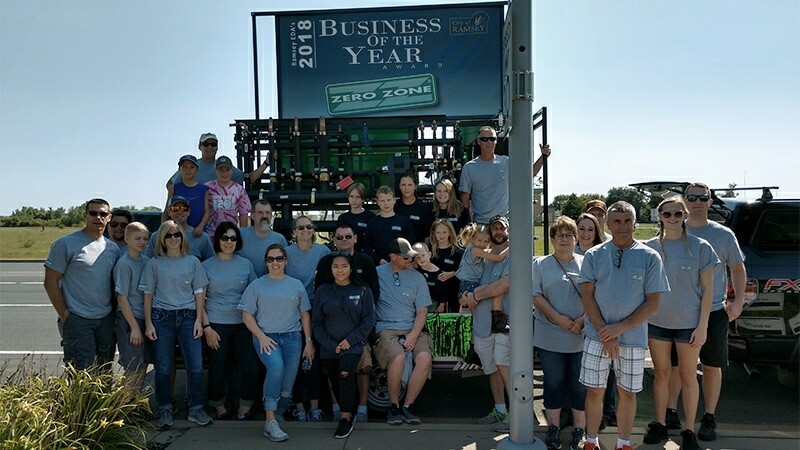 – Zero Zone, Inc.
What Does it Take to be Business of the Year? Home/Blog/What Does it Take to be Business of the Year? Zero Zone and our employees are engaged throughout the Ramsey community. Zero Zone supports various events and organizations in town, including the Happy Days Festival, Safety Camp, and the Ramsey Firefighters Relief Association. Our employees also joined the local Adopt-a-Spot program by cleaning Bunker Lake Boulevard NW. We are involved in these events and programs because they are important to us and to our community. We believe it is our responsibility to give back to a city that has stood with us. We also believe we have a responsibility to showcase the value of manufacturing jobs. Industrial Production Manager Justin Borer assists with setting the curriculum for manufacturing courses at the local high school and technical college. Zero Zone is a member of various manufacturing advocacy organizations, including the National Association of Manufacturing, the local Manufacturing Alliance, and OPTIMA. We are also a charter member of the local Manufacturing Day in Ramsey, MN, since it began in 2012. Not only is Zero Zone a leader in the local community, but also in the entire refrigeration industry. 2018 has been a breakthrough year in terms of natural refrigerants, particularly CO2 transcritical refrigeration. All across the country, there is ever-growing interest in greener solutions. It is the future of refrigeration, and Zero Zone is proud to be among the first to have installed CO2 transcritical systems in supermarkets and ice rinks. We are proud to partner with customers who are reducing their use of refrigerants with high global warming potential by switching to environmentally-friendly natural refrigerants like CO2. Our employees also contribute to the refrigeration industry. Industrial Sales Manager John Collins serves as the chairman of the IIAR CO2 Task Group that writes new safety standards for CO2 refrigeration. This includes every step from design, to installation, and maintenance. By Grant Francis|2018-11-28T14:59:34+00:00November 28th, 2018|Blog|Comments Off on What Does it Take to be Business of the Year? An Open or Shut Case? Copyright © 2016 Zero Zone, Inc.